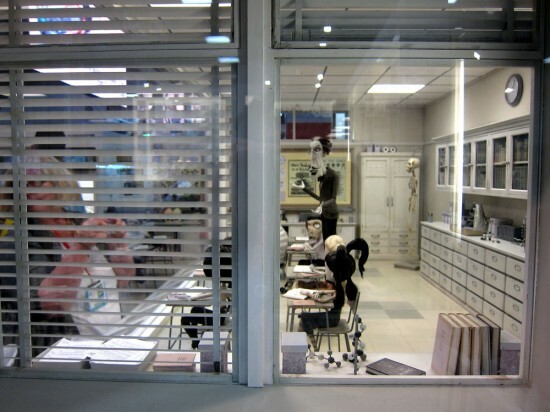 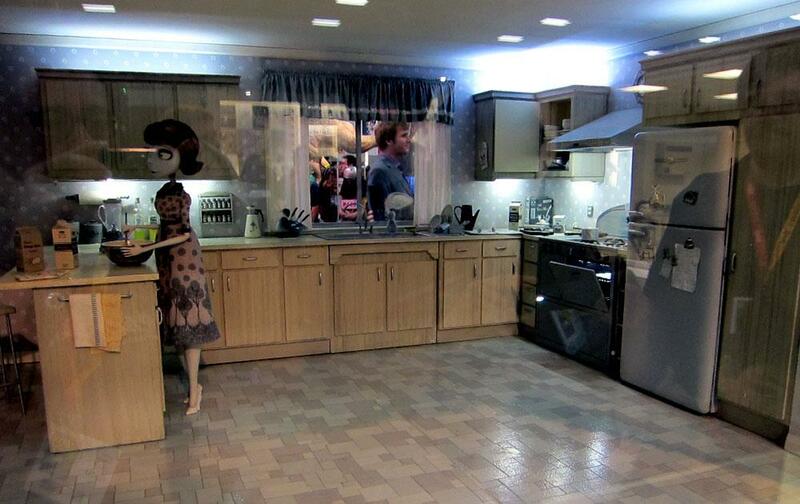 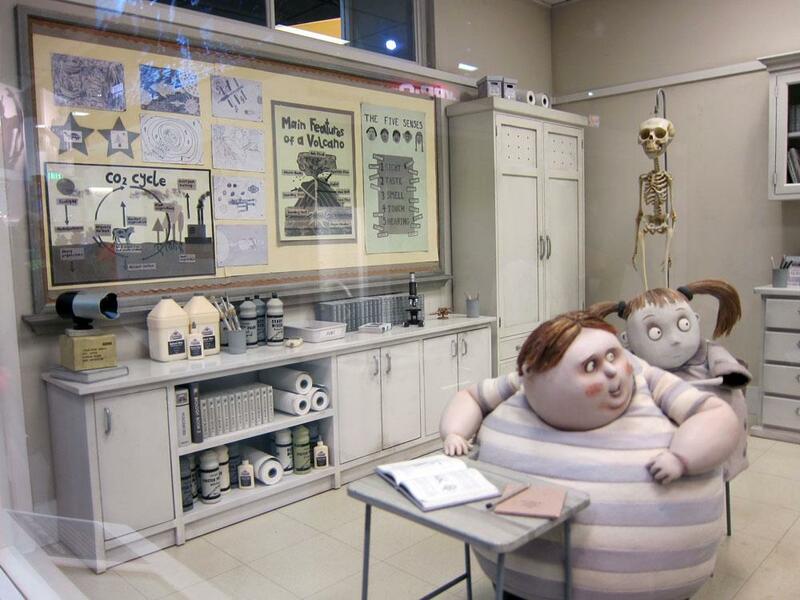 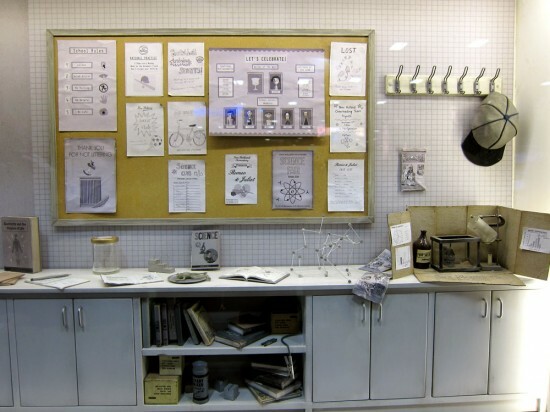 I’m usually much too important of a person to wait in line for things, but upon the recommendation of sculptor/designer Chauskoskis and a peek through the window, I knew I needed to queue up to see the sets, dioramas, props and merchandise for Tim Burton’s upcoming stop-motion film, Frankenweenie. 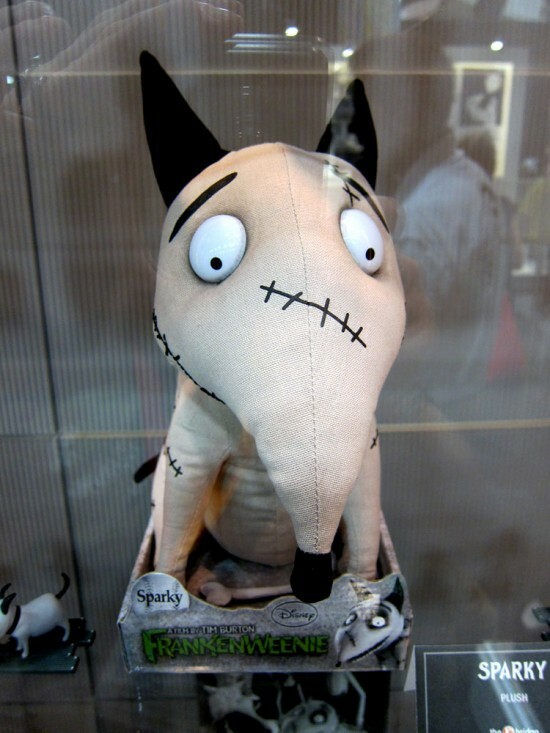 Frankenweenie began as a short film directed and co-written by Tim Burton and produced with Walt Disney Pictures in 1984. After completing the movie, Burton was fired by Disney, with the studio claiming (per Wiki) that Burton “had wasted company resources and felt the film was too scary for young audiences”. 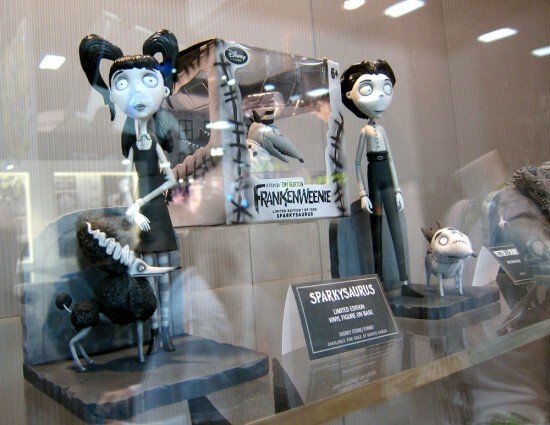 As a result, the Frankenweenie short was shelved for US audiences and had only a small run in the UK in 1985. After the mainstream success of Burton’s features like Beetlejuice, Pee-wee’s Big Adventure and Batman, Disney wised up and released the film on video in 1994. 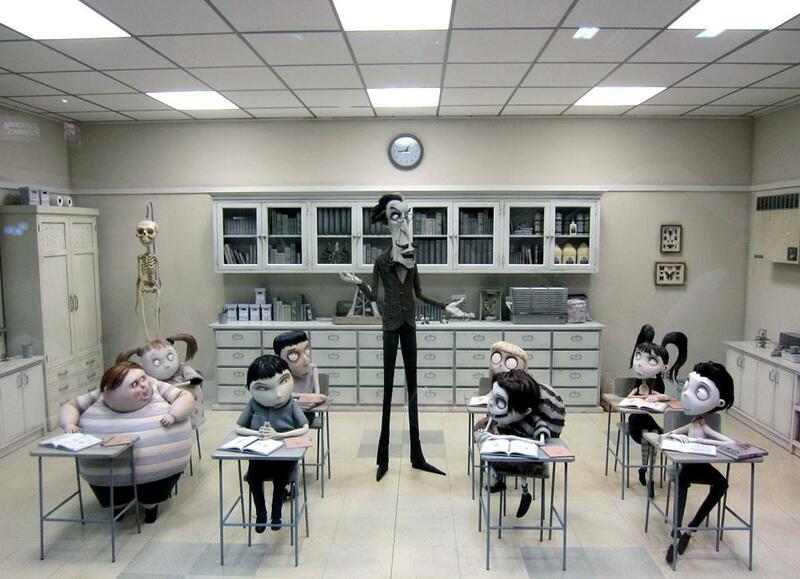 But the story doesn’t end there! 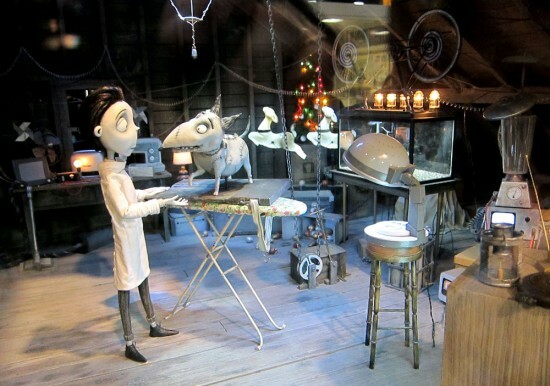 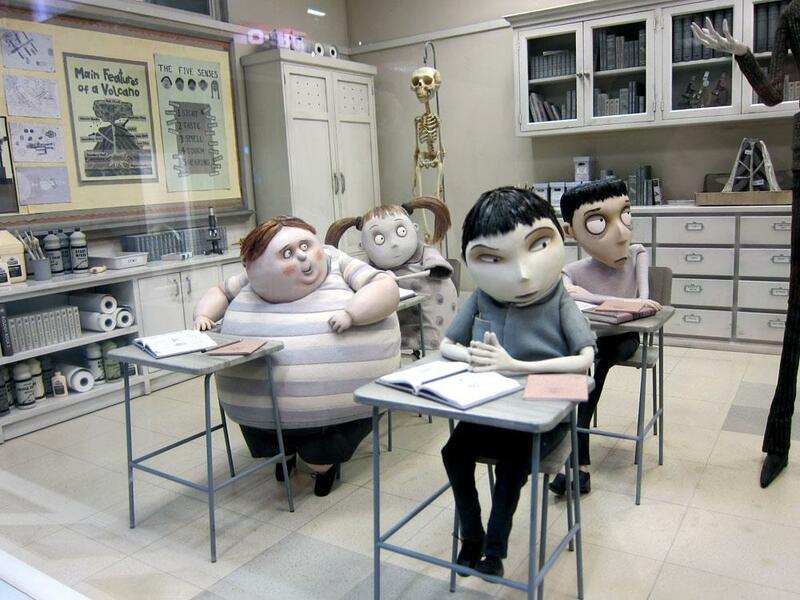 In 2010, Burton began filming a feature-length version of Frankenweenie at London’s 3 Mills Studios. 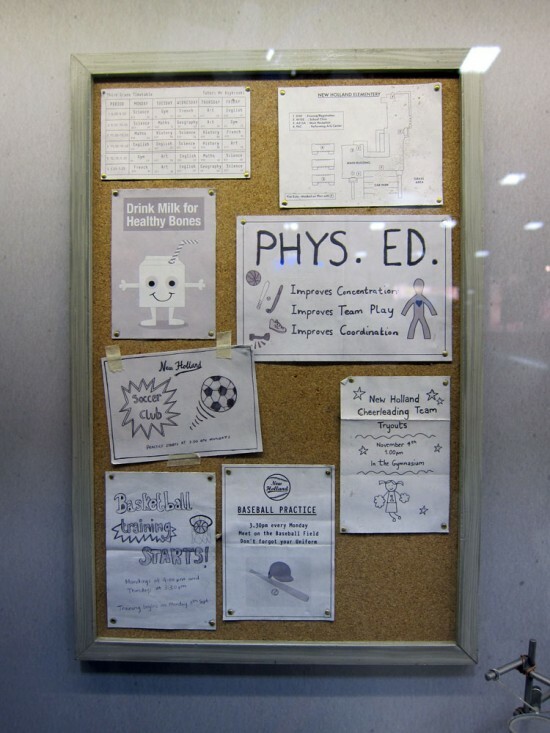 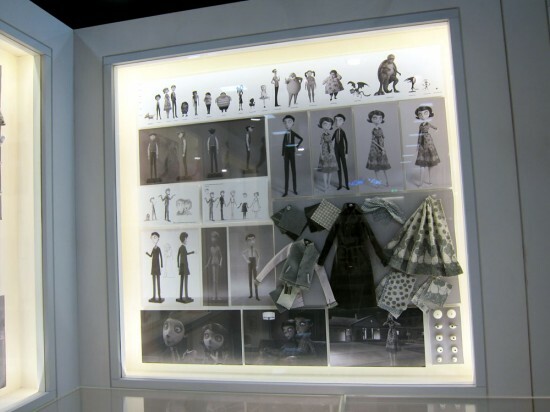 The crew created three giant sound stages, including Victor’s cluttered family attic, a cemetery exterior, and a high school interior. 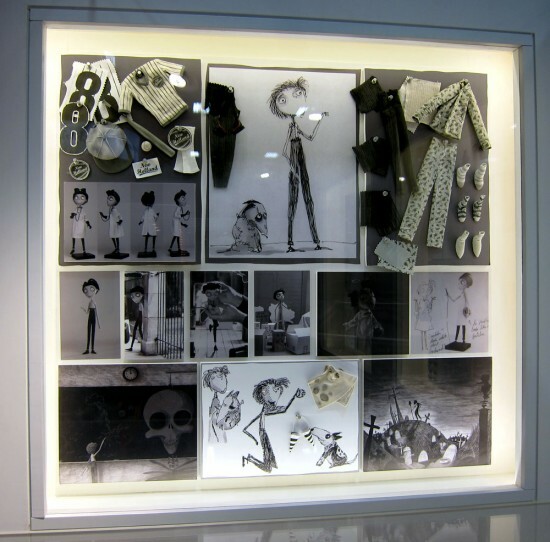 The sound stages were then divided into 30 separate areas to accommodate the handcrafted, frame-by-frame style of stop-motion filmmaking. 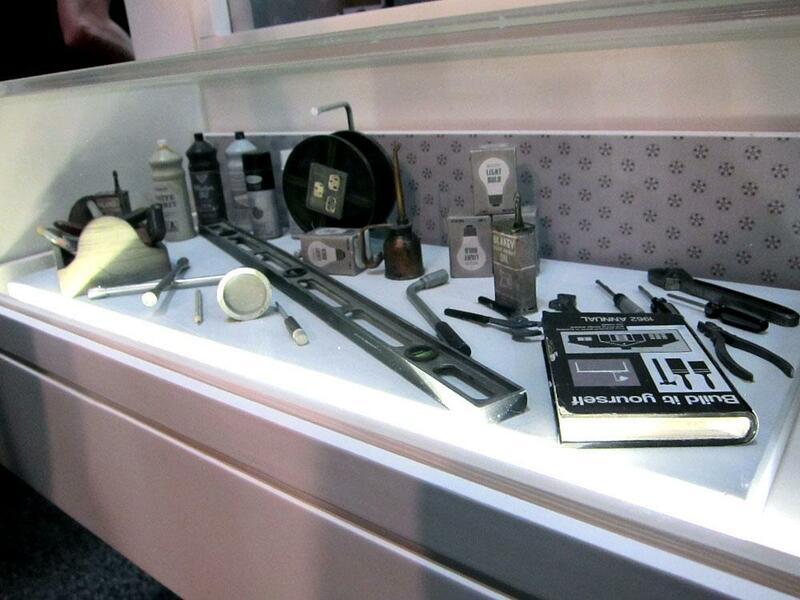 In some instances, they brought in Swiss watchmakers to create the tiny nuts and bolts. 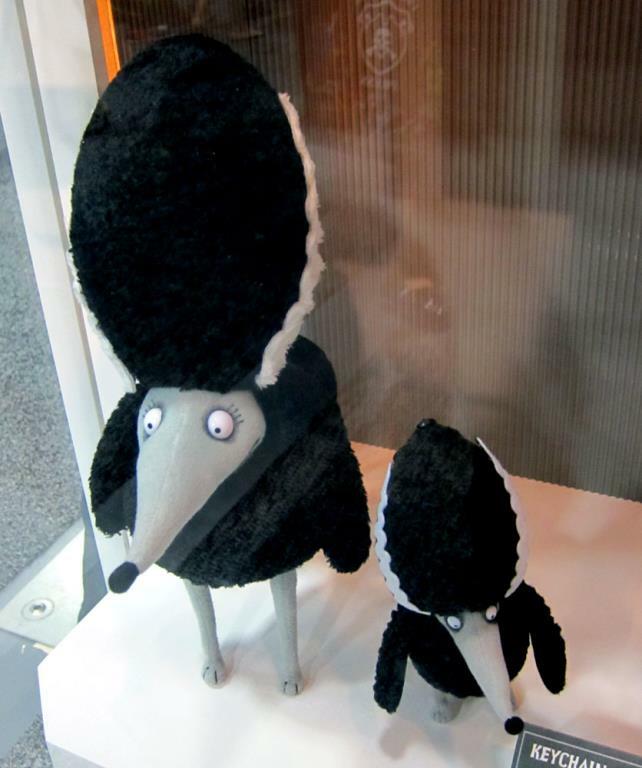 Around 200 separate puppets were used, with roughly 18 different versions of Victor. The puppets also have human hair, with 40–45 joints for the human characters and about 300 parts for Sparky (per Wiki). 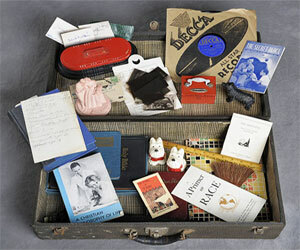 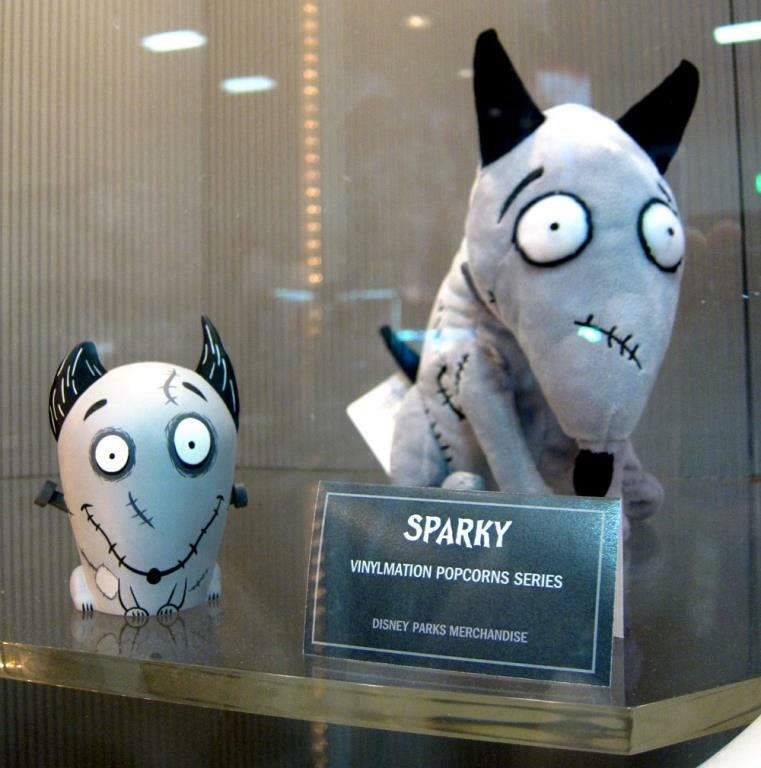 Contrary to what you might think, “Sparky” isn’t directly based on Snoopy creator, Charles “Sparky” Schulz. Rather, Sparky, the Bull Terrier in Frankenweenie is a joke on the use of electricity in the film. Burton intended the short and the feature to be a parody and homage to the 1931 film Frankenstein based on Mary Shelley’s novel. 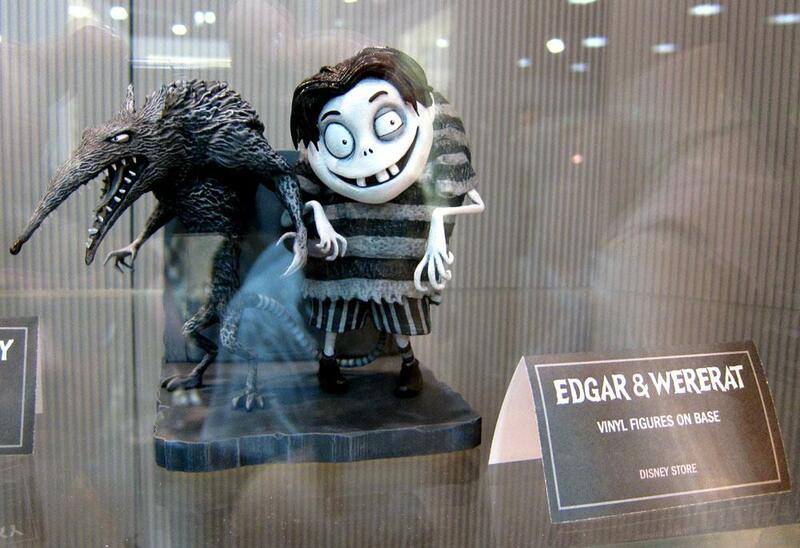 Naturally with such a character-driven movie, Disney is merchandising the hell out of this. 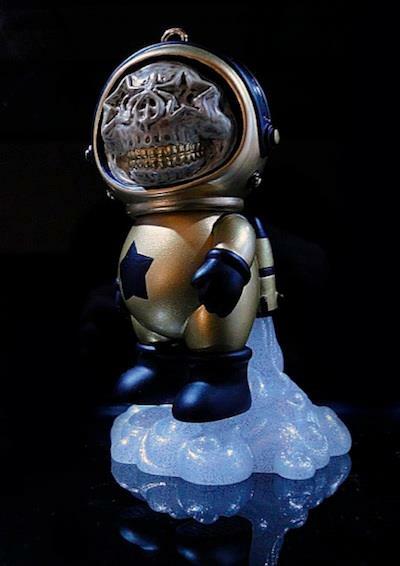 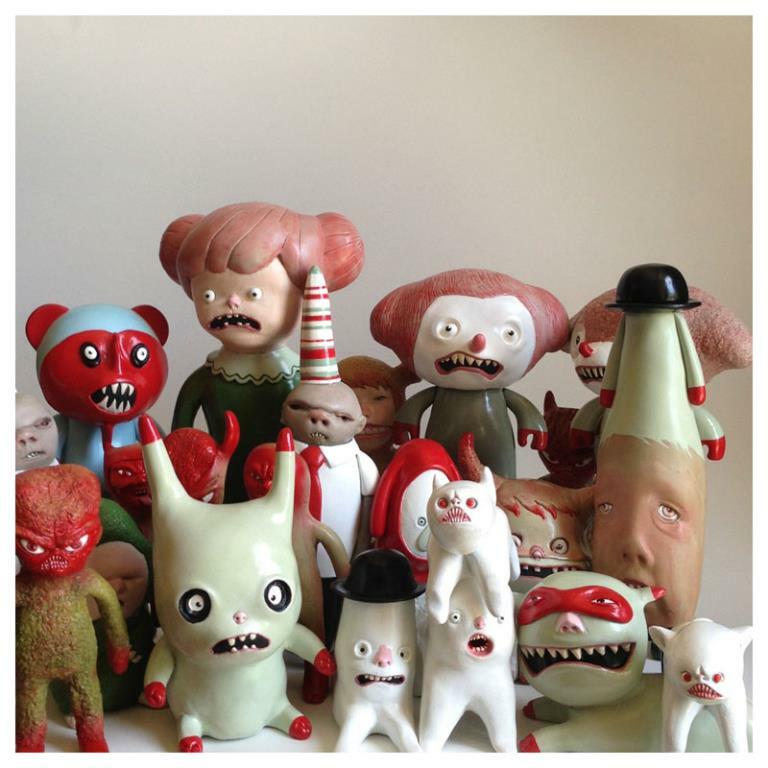 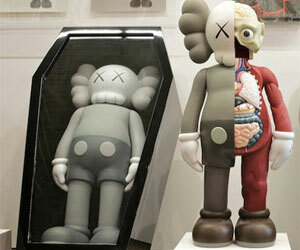 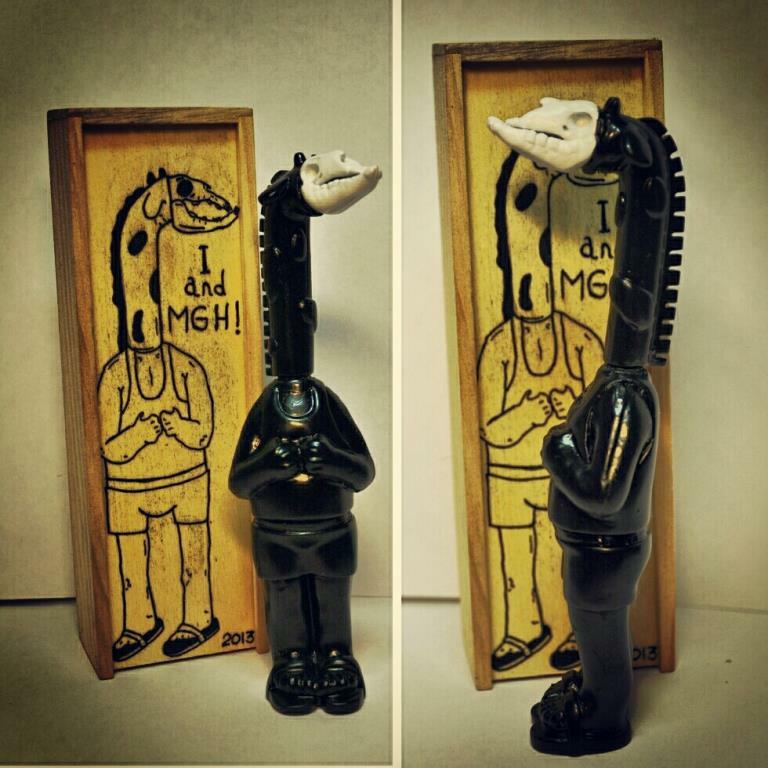 If you’ve visited a Hot Topic in the last decade, you’ve probably seen Burton’s Tragic Toys. These figures are similar, except monotone. 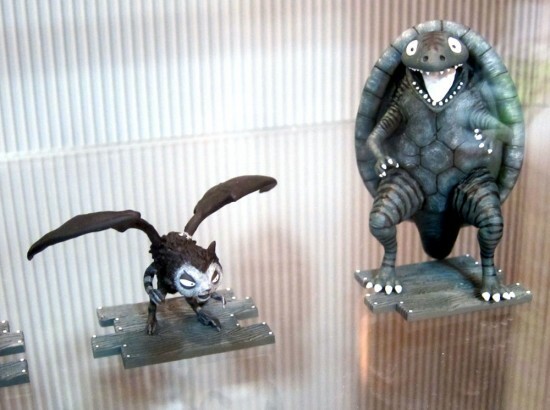 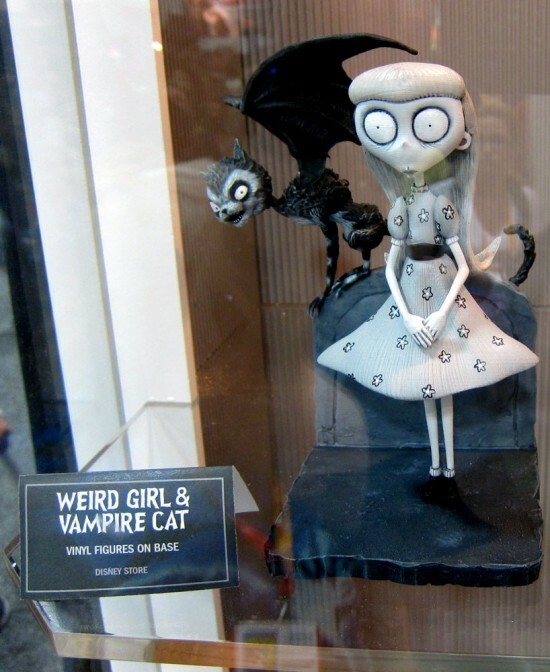 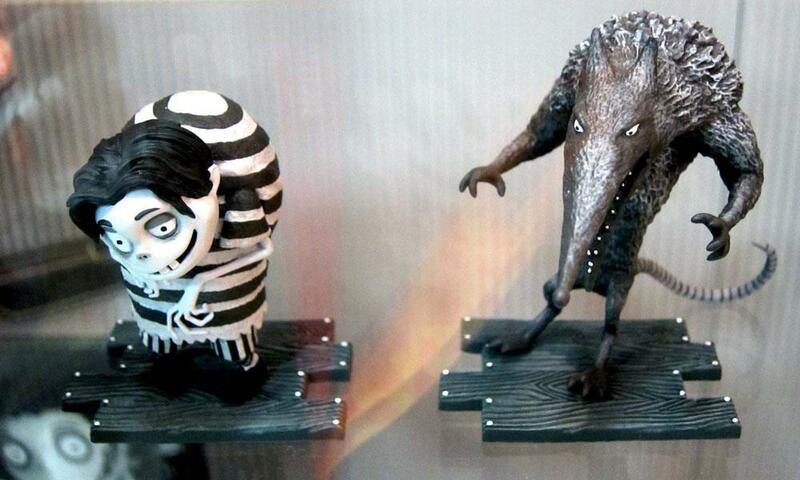 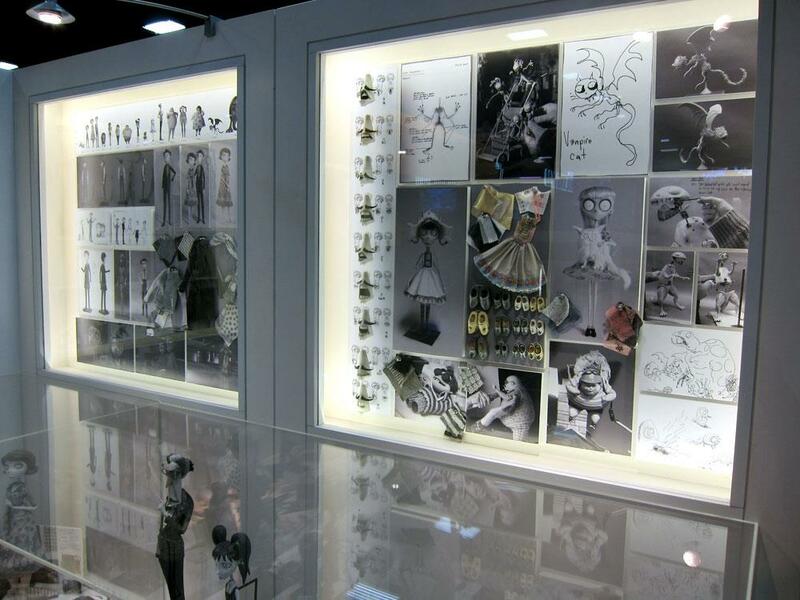 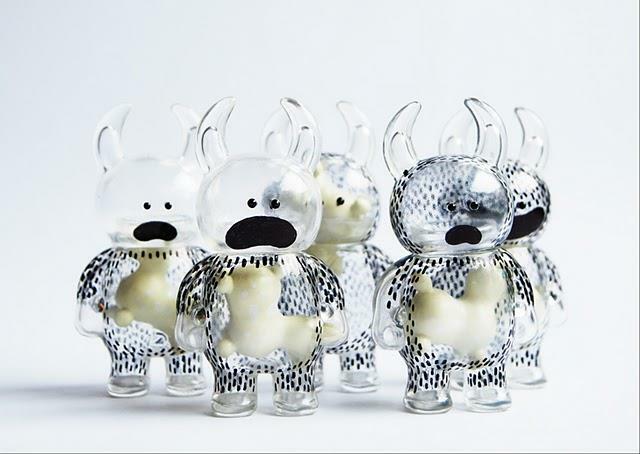 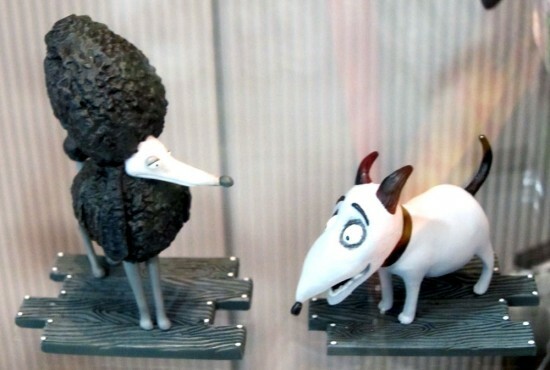 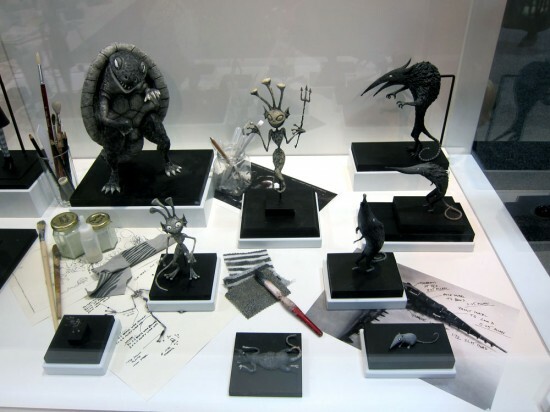 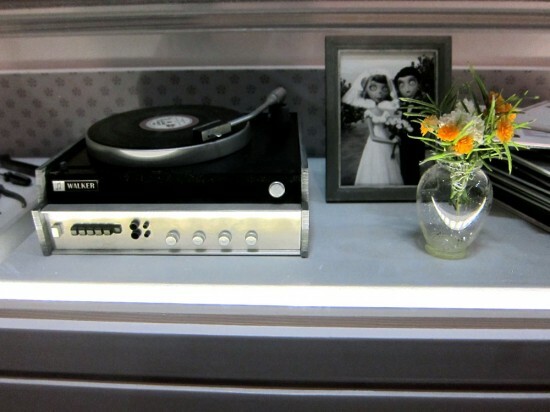 Upon Frankenweenie‘s theatrical release, there will be mini-figures, action figures, plush, and yes, even designer vinyl. 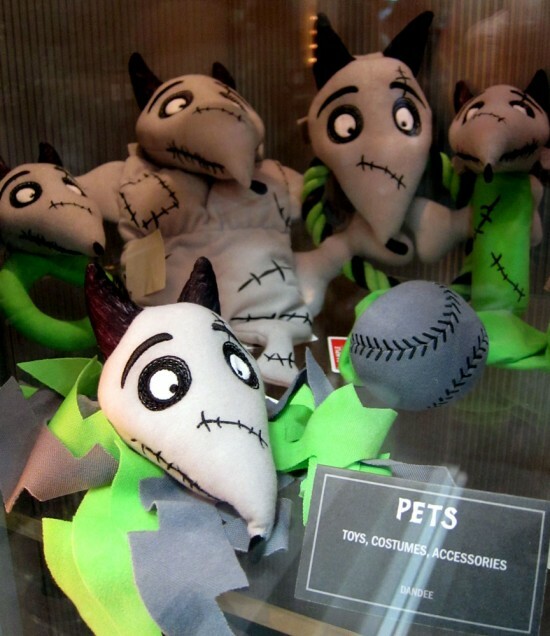 Click through for lots more Frankenweenie! 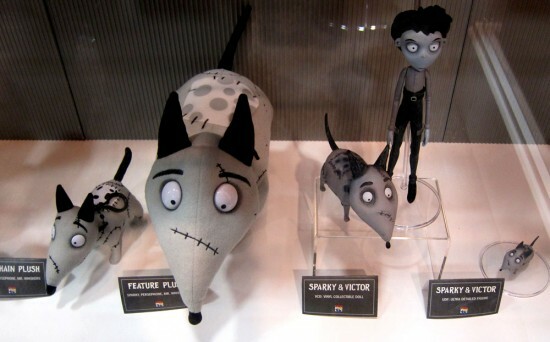 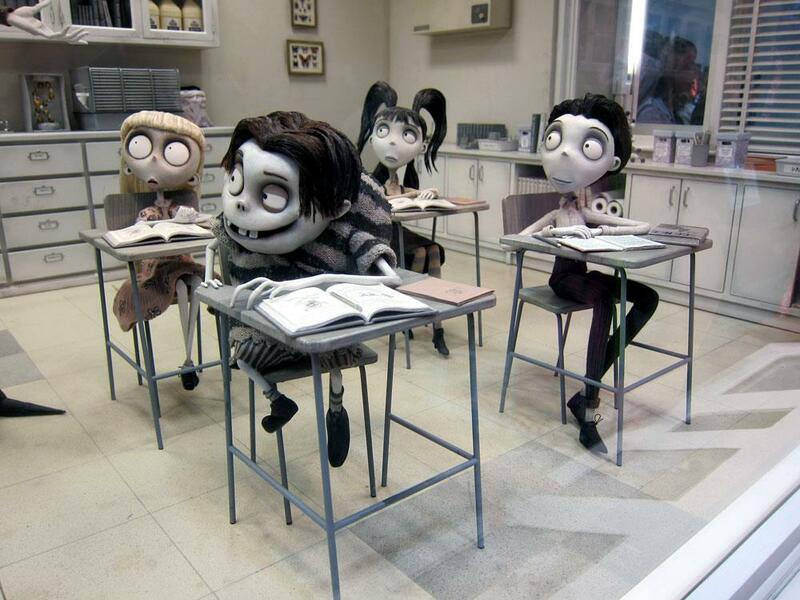 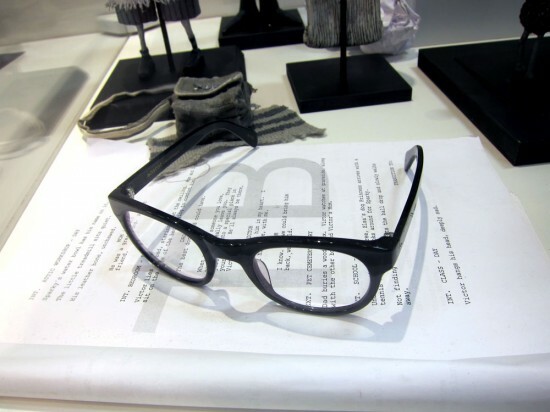 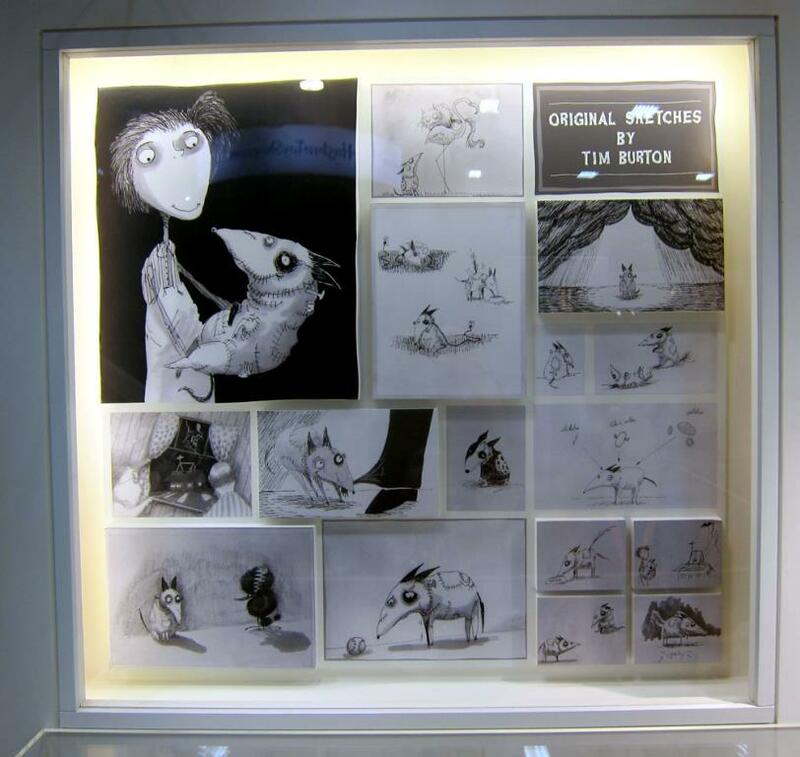 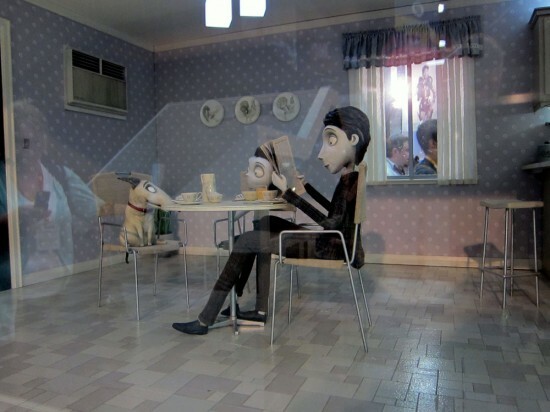 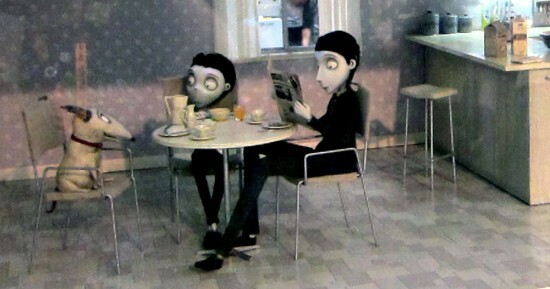 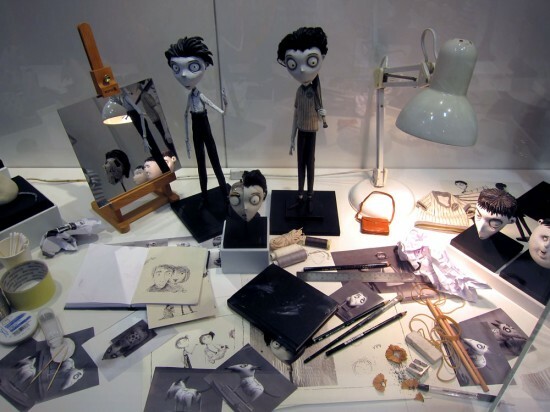 Tim Burton’s Frankenweenie feature-length stop-motion film is scheduled for release on October 5th, 2012. 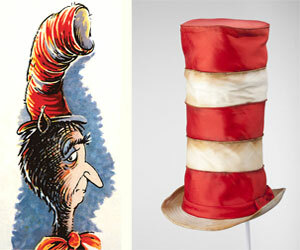 It will be the first black and white feature and also the first stop-motion film to be released in IMAX 3D. 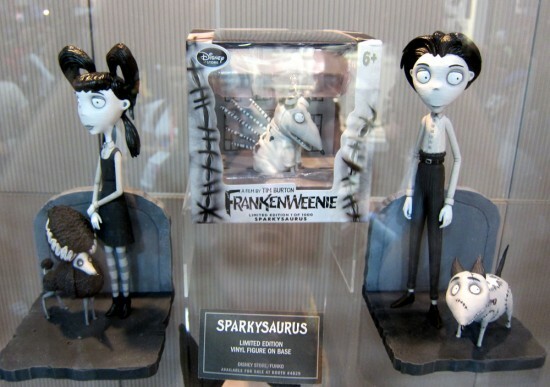 Catherine O’Hara, Martin Short, Martin Landau and WINONA RYDER provide some of the voice talent for the new film, with Christopher Lee, in an uncredited cameo as Dracula in an old movie playing on TV. 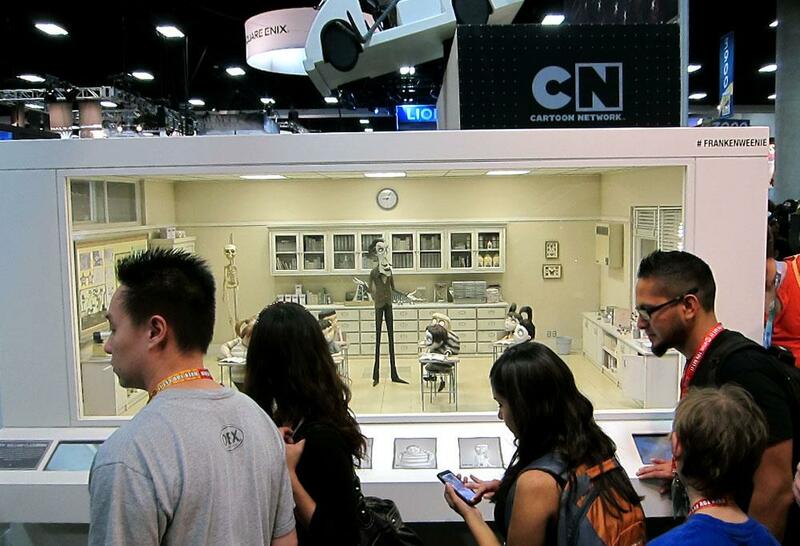 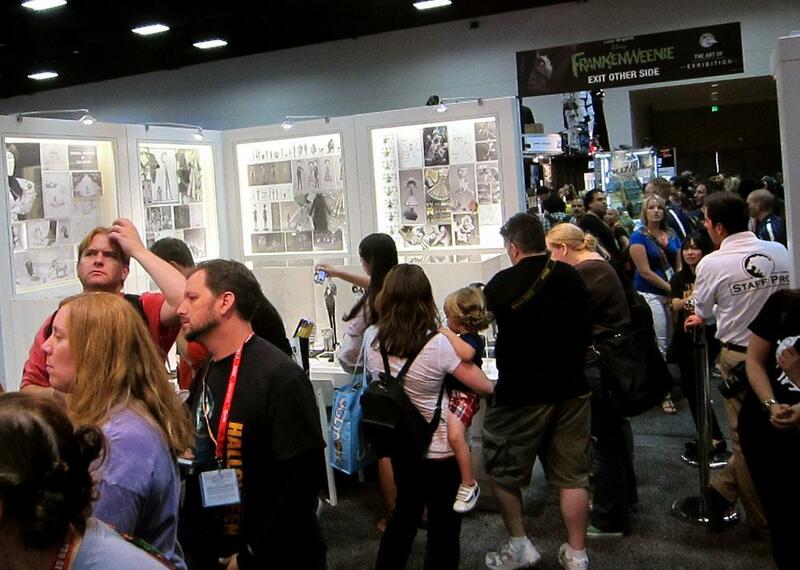 I was lucky to be able to get a close-up look at some of the sets, miniature props and upcoming toys during Comic-Con 2012. 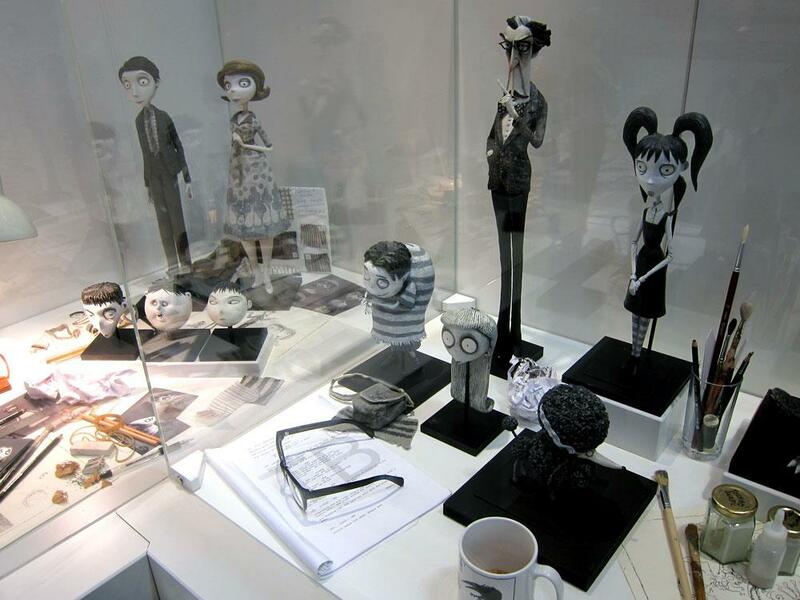 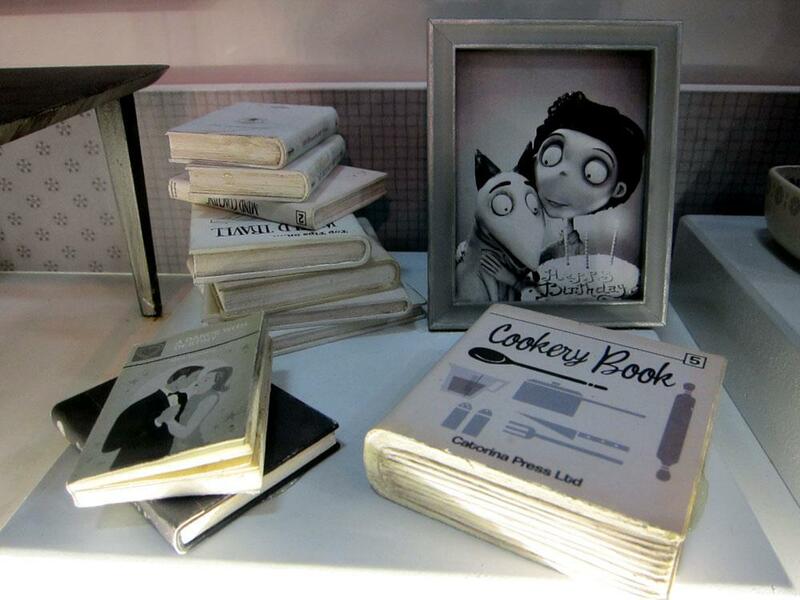 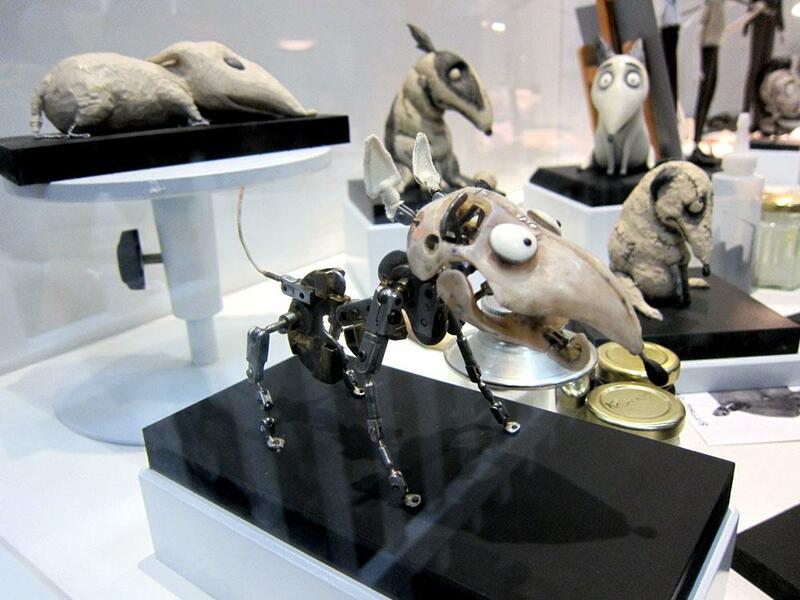 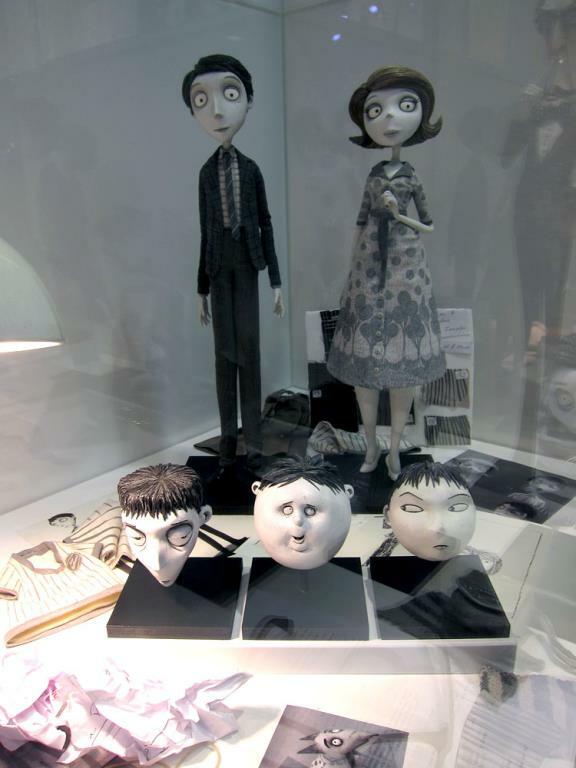 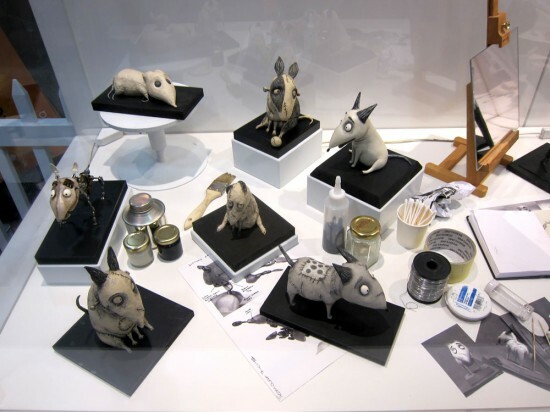 Frankenweenie: The Art of Exhibition next visits Plaza Universidad in Mexico City from July 27th to August 7th with stopovers in Toronto, Madrid, London, Paris and Tokyo to follow. 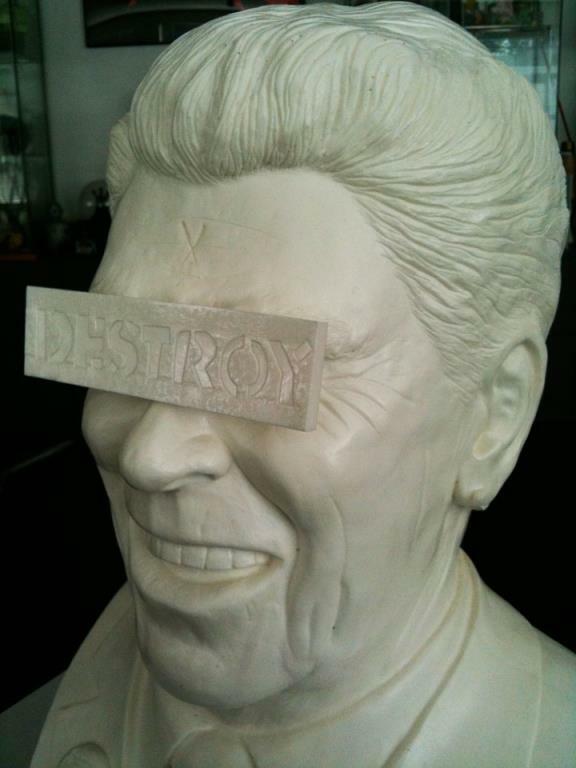 If you’re in or near one of those cities, I HIGHLY RECOMMEND you check this out in person. 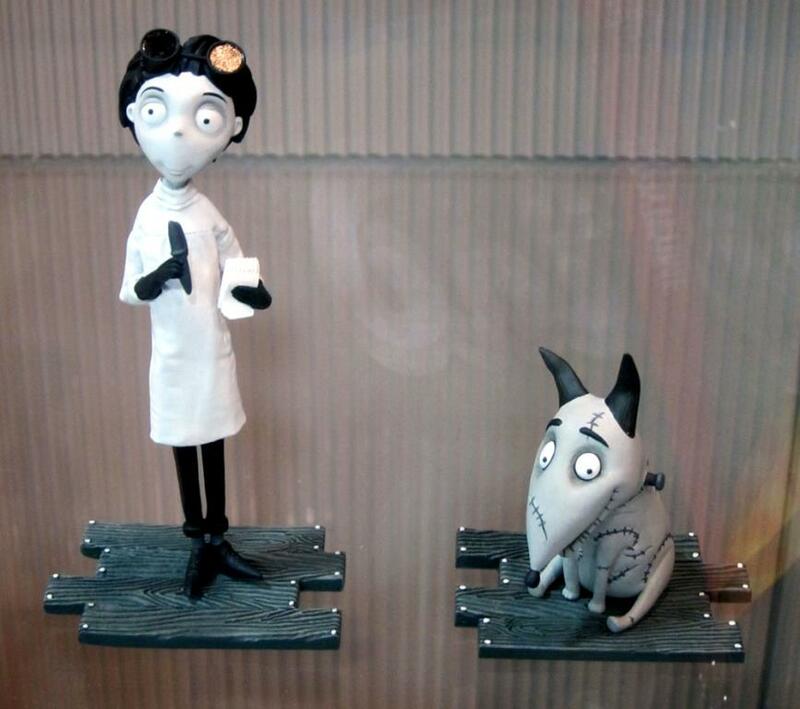 If you can’t make it to the exhibition, check out the theatrical trailer video, and enjoy 40 photos I took of the Frankenweenie characters and sets in San Diego. loved this exhibit, but I didn’t know it was actually going to be in black and white! that makes me a bit sad because I loved their assortment of warm and cool greys and desaturated colours in the models.